Summary: Learn how to apply friezes and borders to a wall, create a frame and use self-adhesive friezes and borders. A frieze or border provides a contrasting or complementary decorative finish to a wall. 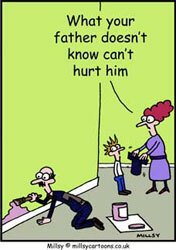 It can also create the effect of making high ceilings seem lower. A frieze should only be applied to a flat and smooth surface, not one that is embossed or textured. If applying a frieze to the top of the wall you will need to prepare a work platform from which you will be able to work without over stretching. Mark the depth of the frieze from the top of the wall and draw a line slightly below this mark using a level. This will compensate for an uneven ceiling edge. A thin band of ceiling paint should then be applied to the top of the wall. A frieze can also be applied at any height on a wall using this method, but without applying the thin band of ceiling paint. Cut the first length of frieze slightly longer than the length of the wall. This is so the join will not be located directly in the corner of the room. Apply wallpaper paste to the back of the first length of frieze using a wallpaper brush. Fold the frieze loosely into a concertina and leave it for ten minutes. Starting from a corner, apply the frieze to the wall addressing its bottom edge to the guideline, unfolding it and brushing the paper smooth. As you continue around the room, join the lengths of frieze together ensuring the pattern matches. Starting from a corner, apply the frieze to the wall addressing its bottom edge to the guideline and brush smooth. A frieze can be used to create a frame. This has the effect of reducing the length of a long and narrow hall or landing. A frame consists of a length of frieze applied vertically at either end of the wall joined at the top by a length of horizontal frieze. At both ends of the wall mark a vertical guideline approximately 250mm (10in) from the edge and to the height you wish the frieze to reach. Cut the vertical lengths of frieze longer than you require and stick them to the wall. 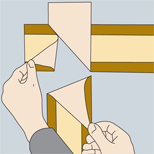 The horizontal part of the frame needs to join the vertical lengths at right angles. Using a spirit level draw a horizontal line at the height you require, which will serve as the guideline for the top edge of the frieze. Measure and cut the horizontal length of frieze, remembering to add a little extra to each end to create an overlap with the vertical lengths. At this stage try to ensure the pattern at the ends of the horizontal length matches the pattern at the top of the vertical lengths. 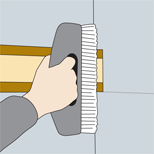 Apply wallpaper paste and stick the horizontal length to the wall using the same method described above. 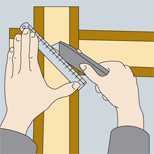 Once the horizontal length of frieze has been applied to the wall, use a straight edge with a craft knife and cut through the overlapping paper at the corner to create the right angle join. Peel away the excess and clean the frame with a wet sponge. Use a straight edge with a craft knife to cut through the overlapping paper at the corner to create a right angle join. If you are using a self-adhesive frieze, peel off small sections of the backing paper at a time as, once applied, the adhesive will damage the surface underneath if pulled away from the wall.